"I would like to thank you and your staff for the helpful and co-operative way in which the work at our house has been carried out. There has always been a friendly greeting from your team, and the work has caused minimal inconvenience to us. 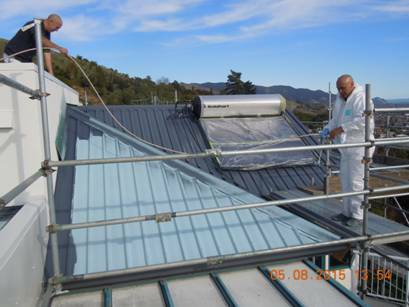 I attach a photo of a couple of your chaps painting the roof. "The house looks much better than I expected, thanks very much for the photos. Now I don't want to sell it at all! Thanks for all the help and contact, this from my point of view has been an excellent operation from a distance. The tenant in my house has also been gratified by the speed and timing of the housepaint." "My wife and I recently finished up a major remodel of our home in Nelson, and had Pinnacle Painters do the painting for us. We were so pleased, not only with the end result, but with the courtesy, respect and professionalism everyone working with Pinnacle showed us during the time they were here. I would highly recommend Pinnacle Painters to anyone, no matter how big or small the project might happen to be. Thanks Pinnacle Painters for a job well done. "Fitzgerald Construction Ltd have had a working relationship with Pinnacle Painters since November 2005. During this time they have undertaken a significant number of projects for us with the value ranging from a few hundred dollars through to in excess of $60,000.00. Eric and his team are highly organised and professional. Their workmanship is to a very high standard and they are both reliable and accommodating. The fact that they take pride in their work is reflected in the end product. Their administration is also very good with payment claims being transparent and submitted by due dates. We look forward to our continued relationship with Pinnacle Painters." "​I feel fortunate to have found Pinnacle Painters and we have now used them for at least three different jobs at our house, and I would not hesitate to recommend them. When I originally needed to find a painter, I called several companies. Most said they were too busy, or they never called back. Eric from Pinnacle not only called me back right away but he came over that day and drove me to a house nearby where he had done a similar job. We have a cedar garage door that had become very weathered and it was in terrible shape, but after they refinished it, now it looks fantastic. When it came time to paint the exterior of the house I was very confident to go with Pinnacle again. It was a big job, with some complex issues, that Eric and his crew handled with ease. Anytime we needed additional outside help, such as from a contractor, scaffolding company, glass company, or custom metalwork, Eric found the right people and coordinated their work. All the painters at Pinnacle that worked here were very professional. They arrived on time, were very friendly, hard working, finished the job in the time quoted and always left things tidy. When it comes time to re-paint the interior of the house, we will be calling Pinnacle. Every day I enjoy the work that was done on the garage door and the exterior paint on the house. You don’t always know what a difference it makes until after it’s done.